Drive Medical Lightweight Adjustable T Handle Cane Black Floral model #10304BF-1. This lightweight adjustable aluminum folding cane with T Handle by Drive Medical is great for individuals on the go. 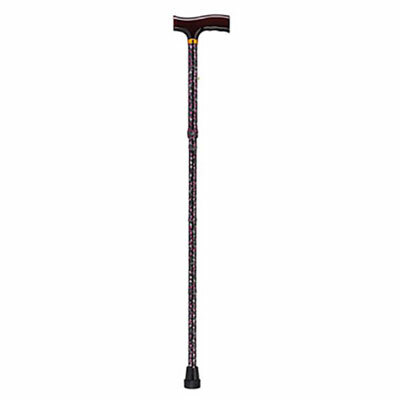 This lightweight adjustable aluminum folding cane with T Handle by Drive Medical is great for individuals on the go. The cane easily folds and unfolds with out tools, making storage or travel convenient. As an added bonus this cane comes with a handy carry holster which keeps the cane folded when not in use. The handle height adjusts in 1" increments from 33" to 37" allowing for personal sizing. Available in a great designer color this cane provides style and quality all in one. The premium grade wood handle is contoured to increase hand comfort and provide safety. This cane includes a plastic carry case and can withstand a weight capacity of 300 lbs. and is protected by a limited lifetime warranty. Cane folds into 4 convenient parts for easy storage. Handle height adjusts in 1" increments from 33" to 37". Attractive wood handle with brass collar. Comes with plastic holster carry case. 300 lbs. Weight Capacity. Limited Lifetime Warranty.